Can You Do Insanity on Three Meals a Day? Can the P90X Work If I Don't Stick to the Meal Plan? You follow the fat shredder eating plan during the first phase of P90X, a 90-day home diet and workout plan is created by Beachbody. After the P90X fat shredder phase, you go through two more nutritional phases, the energy booster and the endurance maximizer. The fat shredder nutrition plan is a higher-protein, lower-carbohydrate eating plan than the two that follow it. During the fat shredder dietary phase you consume 50 percent of your calories from protein, 20 percent from fat and 30 percent from carbohydrate. The goal in the fat shredder portion of P90X is to lose body fat while you strengthen muscle. Athletes need 0.5 to 0.7 g protein per pound of body weight to grow and maintain lean muscle, according to the American Dietetic Association. At the high end that’s 105 g protein, or 420 of your daily calories from protein if you weigh 150 lbs. On an 1,800-calorie diet, the lowest allowed in the fat shredder plan, that would be 20 percent of daily calories. If you are working out hard ADA guidelines call for consuming 2.7 to 4.5 g carbohydrate per pound of body weight. At the low end that’s 405 g carbs for a 150-lb person, which amounts to about 1,620 calories. The ADA also recommends 20 to 35 percent of daily calories come from fat. The overall number of calories you consume is based on your resting metabolic rate, or RMR, and activity level. You multiply your body weight by 10 to get your RMR. Then you multiply your RMR by 20 percent, which gives you your daily activity burn. Add your RMR and daily activity burn, then add that total to 600, which is the number of calories you’ll need daily to perform the P90 X program. This gives you an “energy amount” that helps you determine your “nutrition level.” If your energy amount is 1,800 to 2,399 calories you are a level one and get to consume 1,800 calories daily. If your energy amount is 2,400 to 2,999 you are a level two and get to consume 2,400 calories daily. If your energy amount is 3,000 or greater you are a level three and will consume 3,000 calories daily. Typical breakfasts on the low end of the fat shredder plan are a protein shake, a spinach-egg scramble with 8 oz skim milk and half a grapefruit or a mushroom omelet, 1 cup strawberries and 8 oz 1-percent cottage cheese. A typical lunch is a chef salad, a steak and arugula salad with 2 tbsp. balsamic vinaigrette or a shrimp stir-fry with 1 oz cashews and 1 tbsp. sesame seeds. A typical dinner is 6 oz salmon, 2 tbsp. lemon-dill sauce, 1 cup wild rice, ½ cup asparagus, 1 cup red pepper soup and 1 tbsp. protein powder. The morning snacks are protein bars with recovery drinks. Afternoon snacks include 2 oz soy nuts, 1.5 oz string cheese and 1 oz turkey jerky. If you are at level two, or the middle calorie allotment, you get slightly larger portions on some items, such as 3 oz string cheese instead of 1.5 oz on the snack. You’d bump this snack up at level three by adding 4 oz soy nuts to the 3 oz string cheese. Recipes are provided along with the plan. The second dietary phase on P90X allows for more carbohydrates. You consume 40 percent of your calories from each protein and carbs and 20 percent from fat. The third phase calls for 60 percent carbs, 20 percent protein and 20 percent fat. You are advised to choose how long you want to follow each phase of the nutrition plan. For example, follow the fat shredder portion of the plan for a short time if you already have a low amount of body fat and your energy flags while on it. Extend it if you want to lose more body fat and also have enough energy to push yourself during the P90X workouts. While diet is important on the P90X plan, the workouts are the top emphasis. The P90X system has a system of 12 workouts for you to follow along with the diet. Each targets different areas of your body. 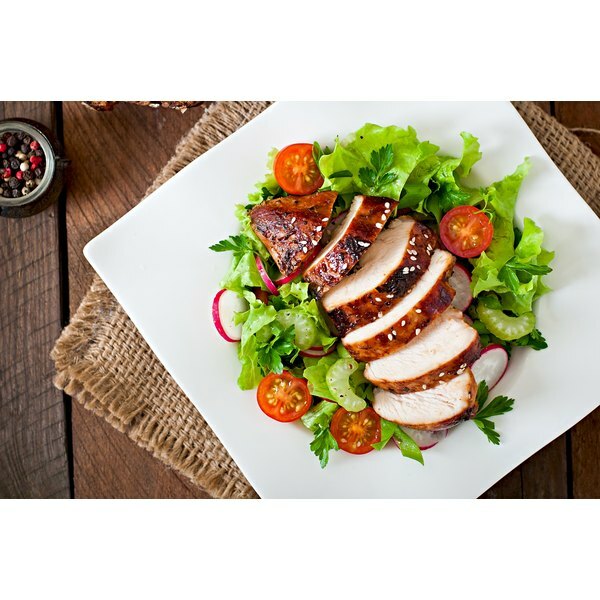 Atkins Diet: How Many Calories Do You Need Per Day?